Tropical Storm Florence continues to drop torrential rain across parts of North and South Carolina as the storm begins its slow slog inland away from the coast. This GOES East satellite image, seen at 7:45 a.m. ET Saturday (Sept. 15), shows Florence still hovering over the Carolinas, not having moved significantly since the storm made landfall Friday morning. At 11 a.m. ET Saturday, the National Hurricane Center said the storm's center was located between Myrtle Beach and (ironically) the city of Florence, South Carolina, with tropical storm-force winds extending up to 150 miles from the center. Florence was downgraded from a hurricane to a tropical storm late Friday afternoon. 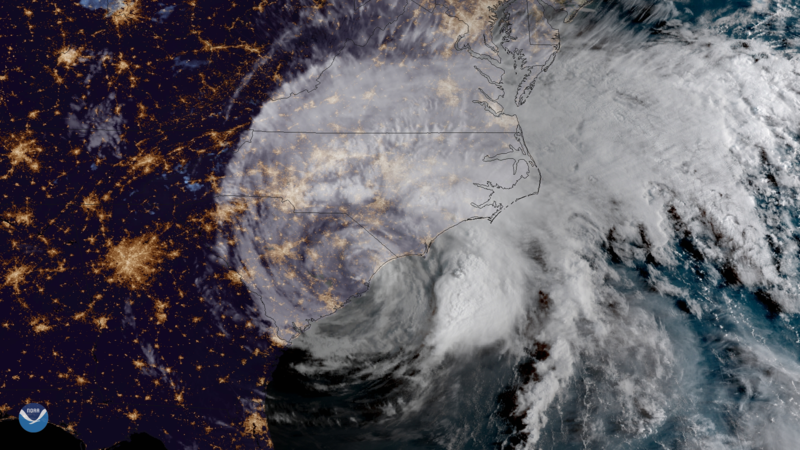 While winds have slackened, the storm has had disruptive, life-threatening impacts across the Carolinas, claiming at least five lives and leaving nearly one million people without power. The National Hurricane Center warns that the storm's excessive rainfall "will continue to produce catastrophic flash flooding and prolonged significant river flooding" over the coming days. Florence has already inundated parts of North Carolina with record-setting rainfall, surpassing two feet in some locations. The National Weather Service reported preliminary totals of nearly 24 inches in Morehead City, N.C. and more than 30 inches in Swansboro, with more on the way. Rainfall totals could approach 40 inches along areas of the North Carolina coast south of Cape Hatteras by the time the storm finally dissipates. See more images of Florence here.